If your home has suffered the unfortunate event of a destructive storm, your roof could be seriously damaged. Even if there was little-to-no rain or hail during the storm, high-speed winds can wreak havoc on your roof, resulting in costly repairs and even total replacement. At A&H Forensic Roofing, we’ve helped hundreds of homeowners throughout North Carolina and Florida properly repair their roof after the devastating effects of a storm. If your roof has been damaged from high winds or falling debris, there are a few things you can do to speed up the repair process. If you’ve started to notice dark circles forming on your ceiling or obvious leaks in your roof, make sure you attend to the damage inside of your home before checking the roof’s exterior. 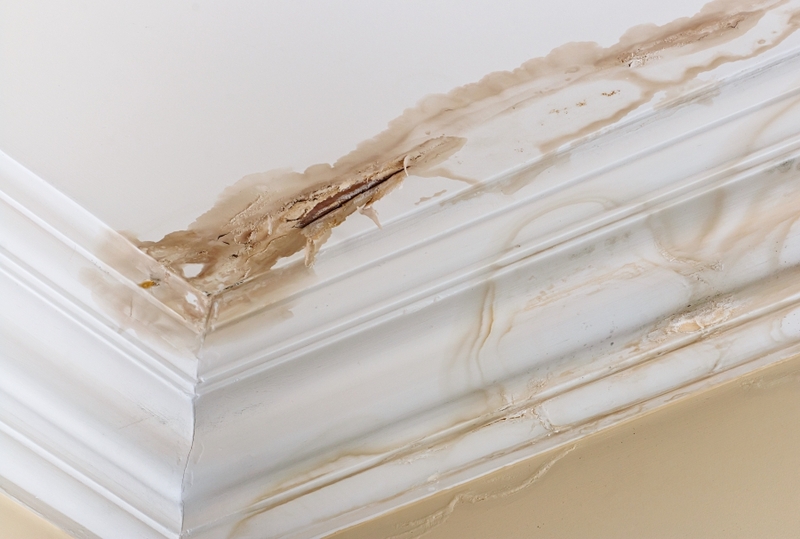 In many cases, a roof leak will slowly pool in your home’s ceiling until it finds another escape route. These escape routes can include light fixtures in your home’s ceiling, which will cause further damage to your ceiling and electrical fixtures. Before you contact a roofing expert to assess the leak, place bowls or buckets under the leaking points of your ceiling. This will help to salvage the interior items of your home, including rugs, carpets and furniture, until your roof inspector arrives. Even though the latest and greatest roofing materials are designed to resist harsh winds and unpredictable weather patterns, the quality of your roof’s materials can weaken over time. Roofs are extremely susceptible to flying debris, so if a tree branch is dragged across your roof during a windy storm, it can bruise your roofing materials and compromise their integrity. According to the National Roofing Contractors Association (NRCA), the edges of your home’s roof are more vulnerable to being damaged during a storm than any other part of your roofing system. If you spot torn or missing shingles on your roof after the event of a storm, contact a professional roofing contractor right away. This could be a clear indication that something is damaged, which can lead to unwanted leaks and a variety of other structural issues. A qualified roof inspector will have the training and necessary equipment needed to properly examine the state of your home’s roof. They’ll be able to recommend the best repair or replacement option for your home, while staying within your individual budget. Once you’ve managed to pinpoint the roof leak and have buckets placed around your home to collect the leaking water, contact a reputable roofing contractor in the area. At A&H Forensic Roofing, we understand how challenging it can be to deal with a leaky roof, especially if the issue occurs in the middle of the night or early in the morning. That’s why we’re proud to offer 24/7 emergency services to our roofing clients across North Carolina and Florida. If your home’s roof has suffered damages from high winds or a storm, contact our roofing contractors today!